» What’s the deal with these stacks? What’s the deal with these stacks? 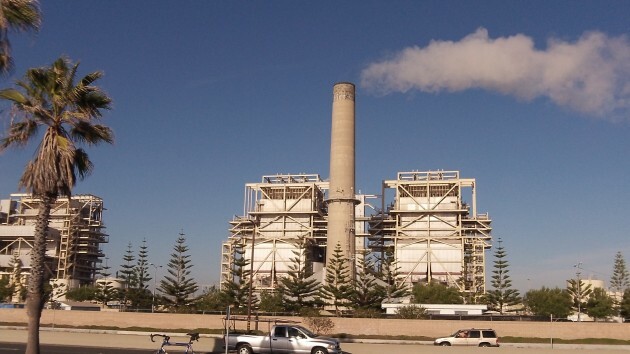 Steam comes from one of the stacks of the AES Generating Station Huntington Beach. There’s an upside to all the rain I hear we’re having in Oregon: We don’t have to consider building a desalinization plant so we can use ocean water to supply our towns. A plant like that is being built next to an electric generating station on the Pacific Coast Highway in California’s Huntington Beach. I read about this project, by a company named Poseidon, when I tried to learn more about the generating station, whose steam stacks I’ve been riding past the last few days. The stacks have been landmarks since 1958 and their days seem to be numbered. The gas-fired power station, run by AES Corp., is undergoing a huge retrofit to meet environmental regulations and make it more efficient. Instead of using seawater for cooling, it will be air-cooled, and its stacks will be replaced by shorter ones. The stack replacement will happen around about 2020, according to a report the Orange County Register updated in 2013. The remodeled plant will use new technology allowing it to start up and shut down within minutes so it can compensate for fluctuations in power produced from wind and solar. With the old equipment it would take hours, the company says. Domestic water in this area now comes from the Sacramento Delta, the Colorado River and from wells, and because of the long drought there isn’t enough of it. So you can see how de-salting seawater makes sense despite the enormous expense. I’d think if the salt gets too concentrated, there would be a greater likelihood of salt deposits on the boiler/evaporator tubes. That results in more down time for expensive cleaning. There could be other restrictions such as salinity/temperature limits for discharge to the ocean. The desal plant uses reverse osmosis. There’s no chemical reaction, just what amounts to a filter. The 74 million gallons per day would return to the Pacific along with the salt from the 50 million gallons per day that becomes potable water. The new equipment is pretty spiffy — gas-fired turbines driving generators, with the turbine exhaust feeding a heat recovery steam generator (aka HRSG) which in turn feeds a steam turbine that spins a generator. High efficiency, flexible, very good turndown. Uses the cleanest commercially-available fuel. Sounds overly complicated when all you have to do to a RO filter is pump water through it.